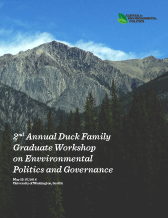 The annual Duck Family Graduate Workshop provides a venue for doctoral students to present their work, receive feedback, and network. We invite select faculty to serve as resource persons. Our endeavor is to host this event every year. Why the workshop? Understanding the governance, policy, and political aspects of environmental issues is critical for addressing environmental challenges. The multi-disciplinary nature of environmental research poses a challenge for scholars to share ideas, concepts, and findings across relevant disciplines. We hope this annual graduate workshop will help overcome these barriers and provide a multi-disciplinary venue for doctoral students to contribute to the study of governance, policy, and political dimensions of environmental issues. This workshop has been made possible by the support of Gary and Susan Duck. We are very sorry to report that Susan Duck passed away in December 2015. She was a wonderful individual and, along with her husband Gary, a passionate supporter of the Center for Environmental Politics. Our prayers are with the Duck family and we dedicate this workshop to her memory.